I love, love, LOVE the farmhouse look. We don’t really live on a farm, but we pretend to, so I love using rustic, charming pieces of furniture in my home. Like my DIY Farmhouse Bench I built for under $20, or my planter box centerpiece. I love Ikea’s furniture because it is so simple and sleek (and inexpensive!). I like to use Ikea furniture as the “bones” for my projects. 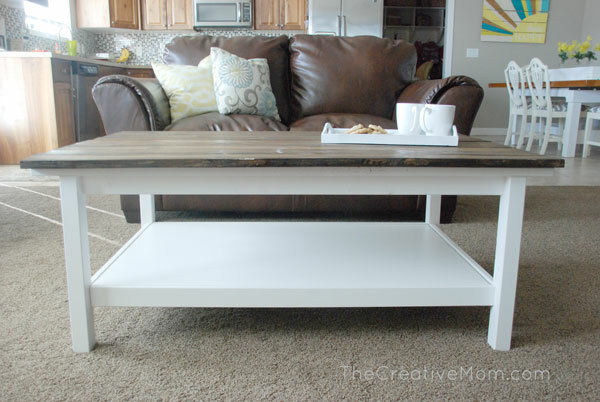 So I came up with this simple little Ikea Hack to make this DIY Famhouse Coffee Table, which matches my own personal style. And I think it turned out pretty cute! 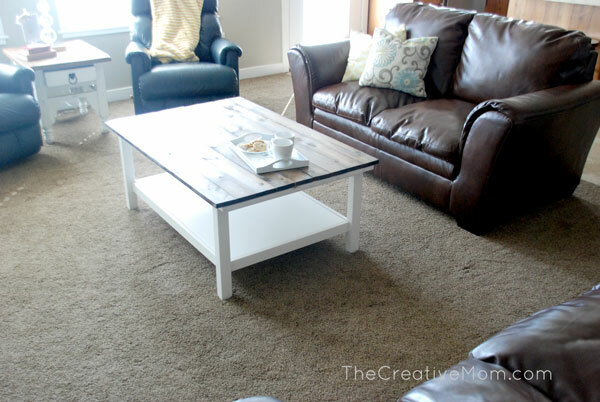 If you don’t want to go to the expense of buying a new coffee table for this project, just use whatever old coffee table you have- the idea for the project is the same. 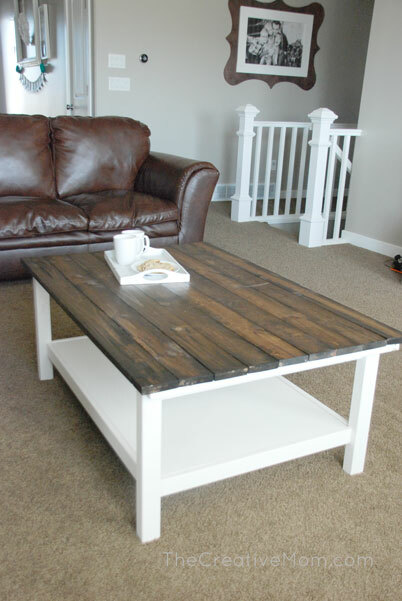 Just take a regular coffee table and add planks to the top to give it the rustic farmhouse look. 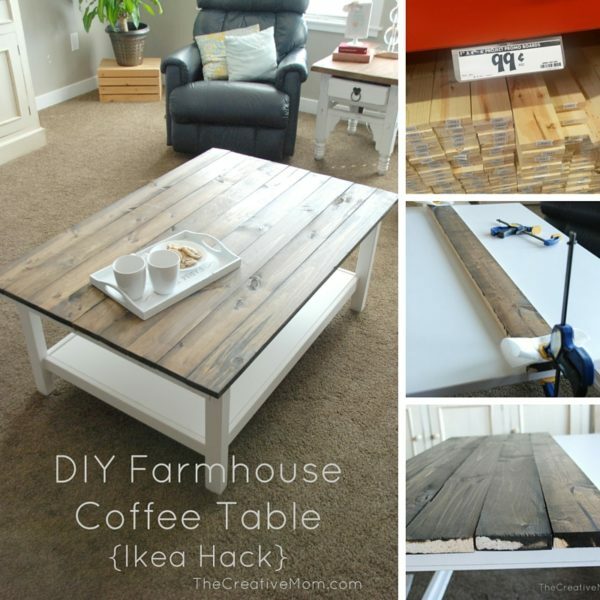 Coffee Table (Ikea Hemnes or Lack )- or whatever old coffee table you have. Start by purchasing your 1×4’s. Measure ahead of time so you know how big you need them. You can cut them at home if you have a saw, or have the Home Depot guy cut them for you (he will be happy to). I used the Hemnes table, and needed my boards to 48 inches. I was lucky to find my 1×4’s ON SALE in a 4 foot length at my local Home Depot, so I didn’t need to cut them at all. Make sure when you’re picking out your lumber, you choose the straightest, nicest pieces of wood. You’ll want to make sure they lay flat and aren’t warped at all. 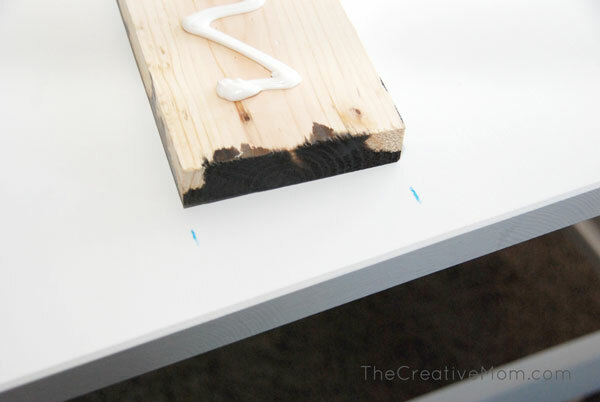 Give your boards a nice coat of stain. I used My FAVORITE stain! I pretty much use it on every project. Then once it was dry, I finished it with THIS Wipe-On Poly . The Polyurethane simply finishes and protects the wood, making it last longer and stay nicer. And this Poly won’t yellow, which is SO awesome! I marked off the center of my coffee table so I knew where to place my center board. 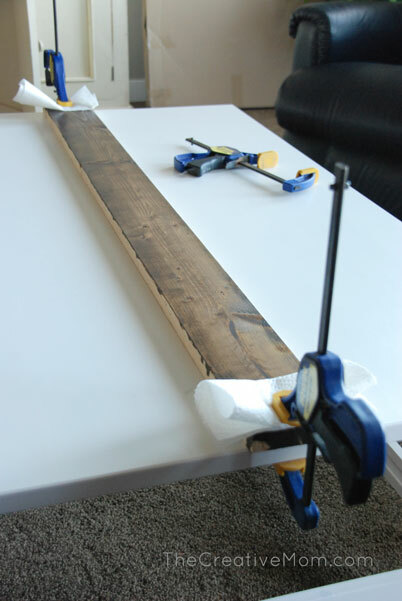 Place your board in the center of your table and clamp each end down so it won’t move. I used these clamps, but tmy favorite clamps are the Kreg clamps, which are SO amazing! Also, this price on Amazon is pretty great, about the same as you’ll find in the hardware stores! Then you’ll use your impact driver to screw a couple of screws on the underside of each end to secure it in place until the glue dries. 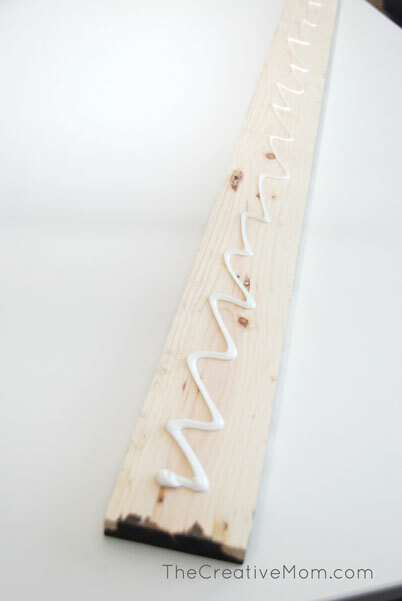 The glue is going to be what really holds the boards on, but you’ll want some screws in each end to make sure it stays in place until the glue is nice and dry. (And yes, I should have stained those edges… whoopsie!) 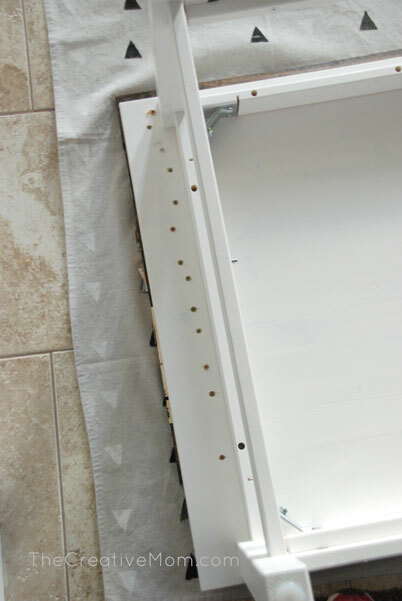 After you secure your middle board, work outwards- gluing each board, clamping it, and screwing it in place. Let me just talk for a minute about why I love impact drivers rather than regular drills. Impact drivers use IMPACT to drive the screws (hence the name). It’s really important in this case, because we are drilling from the underside, and we really want the board to be sucked in by the screw and lay flush and tight against the table. This Ryobi Impact Driver is the one I use, and I love it. The underside isn’t very pretty, but who cares? You’ll just make sure you have screws holding the ends of each board in place. After all the boards are glued and screwed, turn the entire thing upside down and put something really heavy on the middle part. Then let it sit overnight. 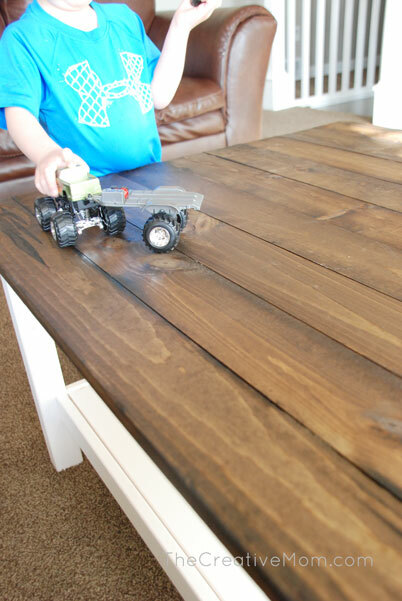 This will ensure your boards are flat and stuck down really well, so the top of your table isn’t all warped and uneven. After it dries overnight, screw a few more screws in the center of each board (on the underside). I ended up having each end screwed, and 3 screws in the center of each board, about every foot or so. This will just help hold the boards in place, so they don’t wobble or warp over time. 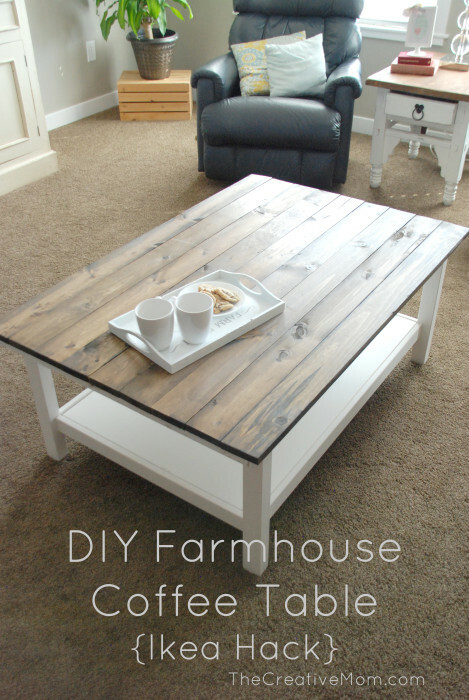 Then, once you turn your table right-side up, you won’t see any glue or screws… just a beautiful, rustic, farmhouse coffee table. I am in LOVE with how it turned out. It is exactly the style and look I was going for! And it fits perfectly in my home. Plus, the kids love having a new racetrack to play on. Because I used pine (a softer wood), it won’t stand up to scuffs and scratches as well as a harder wood. But I don’t mind if it gets used and beat up a little bit, because it just adds to the character and rustic feel I was going for. Before I go, I want to share this totally off subject tip. If you have a son, they NEED (yes, I said need) a truck and trailer combo. Seriously, best toy for boys of all time. My kids (even my girl) really love this Monster Truck and Trailer Set . You’re welcome, and yes, totally off subject! OK, folks. Get off Natalie’s case. She picked up lumber at a bargain price on sale. If your store does not have them on sale, you pay regular price, DUH! Read my post on bargain lumber – and FREE. I buy lumber from sawmills AT 20%-40% OFF RETAIL. Stack and sticker in the dry for a year. Look at all the money I save buying from local sawmills. I have about 1,000 to 1,500 board feet various species at various stages of drying. So, when I say I buy Red Cedar (3/4″x24″ 4″ to 6″ wide) all neatly packed into 200 boards for $30,. It’s true. Just have to shop around. Google SAWMILLS in your ares. Unless you live in a desert, they are around. 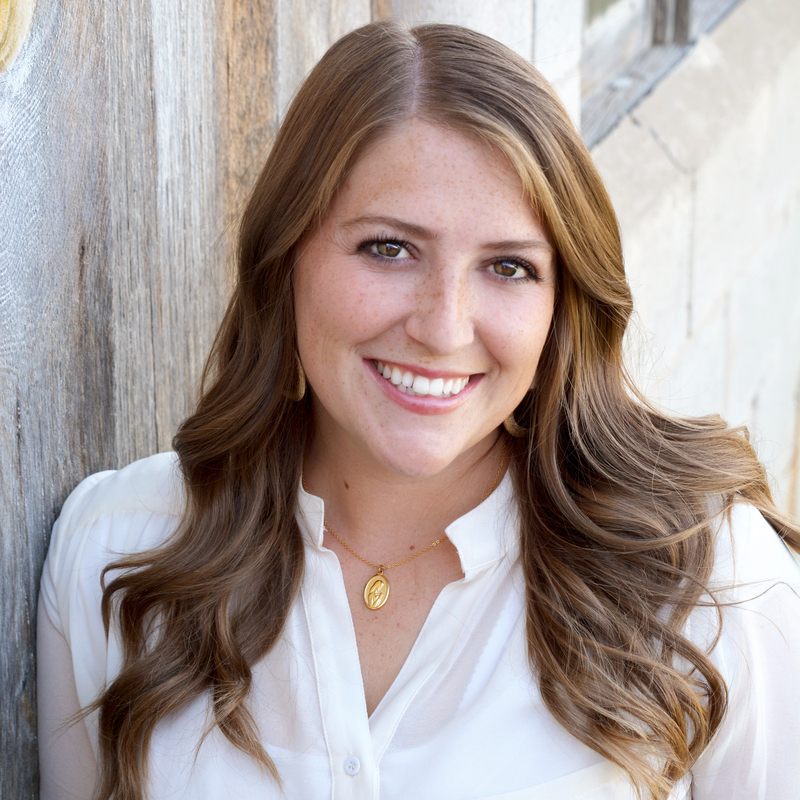 Hi Natalie – Just a FYI – You mentioned getting 1x4s on sale at HD. I happened by a local Lowes last year. Someone had returned 400 treated fence pickets. I asked about them and what price to buy them all. Manager said 50-cents each. I loaded all I could get in my suv, unloaded and went back with my trailer and got them all. I use them for lots of things. FREE lumber at Lowe’s- lumber, drywall and plywood come banded. They use pine of several sizes to keep the bands from damaging the product. Those are at the back door. They are free. Couple of weeks ago the free stuff included 1/2 peg board panel and 7- 1×3 pine lumber with defects. GREAT JOB! I too am a do-it-yourselfer … I enjoy coming up with ideas then seeing it once it is made … I also make my own preserves of food to enjoy throughout the winter … it makes a nice welcomed change to have something “different” in the home on those winter days that sometimes seems so dreary outside and you’re stuck inside … it’s so nice to be retired and single again to enjoy what you love which also includes crocheting – they make great gifts to give away all throughout the year. I think the table looks AMAZING and I am so excited to try it with mine. I am sorry that so many people wrote negative comments (mostly about price) when you gave such good directions and details about how to do it. 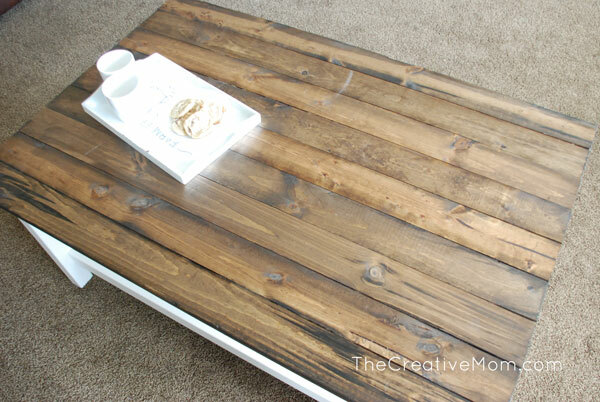 Looking forward to “creating” my own “new” coffee table this weekend! 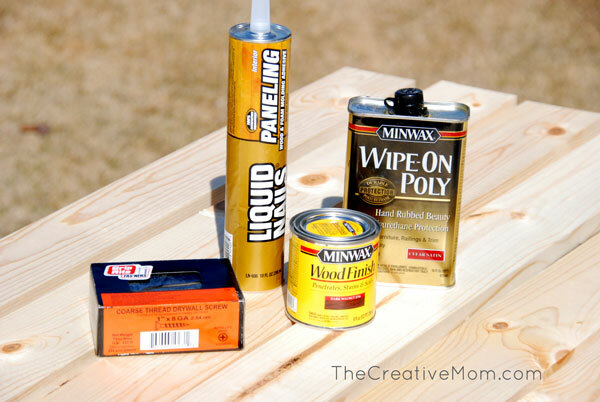 Did you sand your boards before staining? I just bought all the stuff I need, but didn’t get sand paper because I didn’t see it on your list. Although, if I had to do it again, I would also invest in some wood conditioner as my planks absorbed the stain a little unevenly. It was not $10, I went to home depot and purchased all the items exactly what you have on here plus the clamps, it is no were near that amount. I could have just bought another table. Not sure where you live but Im in Texas and my sister is in Missouri I was trying to o a project she did She told me to go to Lowes or Home Depot to buy the wood. Her cost wasw $5.96 The cost for the SAME piece of wood in Texas was $12.96 So my project would have gone up $7 more for each piece of wood I needed Maybe something similar happened here? Just a heads up because I was shocked in the price difference for the same wood at the same stores in different States! You didn’t have to buy the items and how was it misleading ? Did your store not advertise the prices prior to you buying ? The blogger paid what she paid not her prob your store sold for different amounts. Seriously ??? It is actually misleading. The title of the article says you can make it for less than $10, but when you read the post in detail, she says less than $10 for the wood. Super misleading! Extremely misleading that the title of the article says do this for less than $10, but when you read it in detail, it says $10 for the wood ALONE! Also, she says to wait for the stain to dry which is not accurate either. The directions on the container say to let it sit for 20 minutes and then wipe off the rest. I’m still working on mine, and it looks beautiful so far, but I’m upset that this is now a $75 table. Did you send the boards at all?? Question: I bought the lack table Instead of the hemmes, will the boards be the same dimensions as the ones you used for the hemmes table? The “Lack” table from IKEA is actually about 1.5 inches shorter. Remember: measure twice, cut once. Good luck on your project! Where in the world did you find those boards for 99 cents!?!? We only have 1x4x6 and longer, and they start at around $7! I think my Home Depot must have been having a promotion or a special on these boards, because I haven’t been able to find them since that day I did this project. Super bummer! 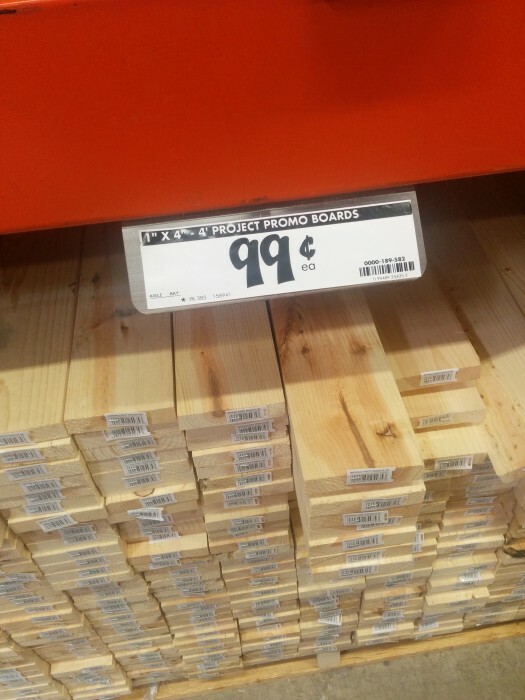 The picture of the lumber you included on the post says it’s a “promo”. Looks like you got lucky the day you shopped! Most LOWE’S have just what you need! 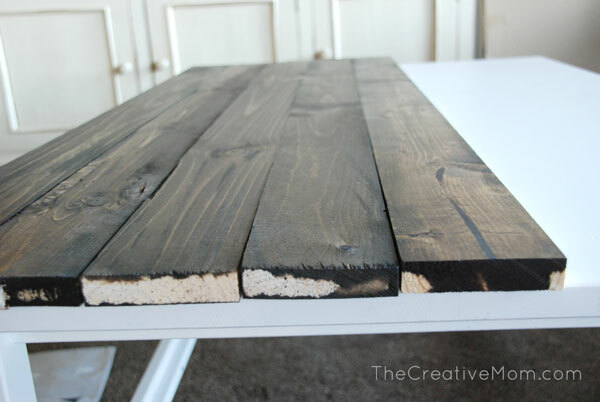 you should really stain or paint both sides of the boards to prevent warping. This is EXACTLY what I was looking for! I’m new to furniture DIY and I have this insanely ugly drafting table similar to ikea type furniture after a ton of moving and overshooting the cutting mat with my razor blades. This is the easiest idea I found on Pinterest! Perfect! Just finished making a version of this an Ikea Lack side table. From mediocre to fabulous in just a few days! Thanks. Yes ^^^ I need help with that! I bought the Lack table and used 1×4’s and they’re length was 46.5′. If you measure your table you should be able to figure it out. Girl I am in love with this table and I love even more that you made this look SO easy to make!!! I now want one really bad – great job girl! Loved watching you! 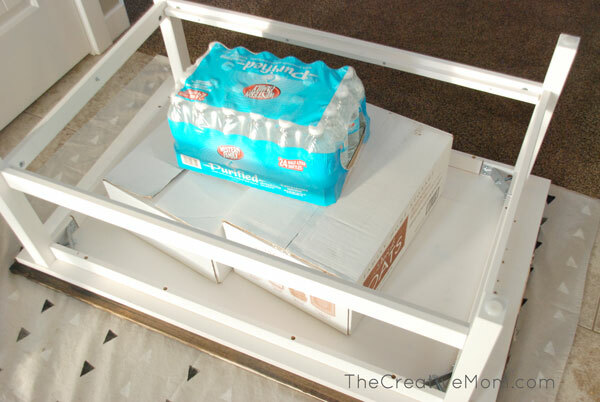 First you must have a coffee table at home or this project would end up over hundreds. This ikea coffee table sell for around $240 before tax at IKEA.